Updating-your-browser.org is a domain where users are warned that their browsers are outdated and that they should update their present version. Updating-your-browser.org is available on every browser and promotes updates according to the browser that is used. Unlike the notorious phishing domain budded as Fake Google Chrome Update, Updating-your-browser.org does not install any updates. It only uses Premium Installer, which installs Optimizer Pro, YTDownloader, Shopper-Pro, and provides the user with links to the official websites of different internet browsers. 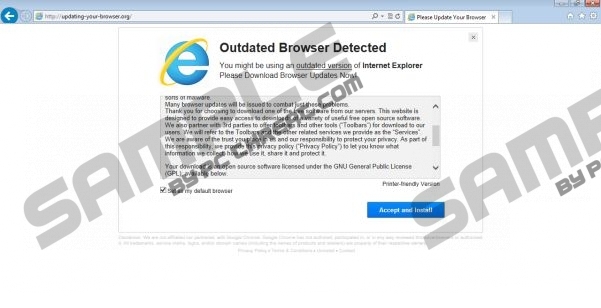 It is very important that you remove the programs acquired through Updating-your-browser.org because one of them is an adware program, which adds its display advertisements to ebay.com, target.com, and many other websites. In addition to PC Optimizer Pro, you may also be exposed to MyPCBack. These applications are not dangerous, only distributed alongside freeware, which are usually not appreciated by computer users. As to the advertisements, you should keep in mind that they may invite you to read some articles on healthy diet, download computer applications, scan your computer on the Internet, and the like. Avoid clicking on such ads because you do not know where they can take you. A single click might lead to computer infections or a phishing website, so do not risk your privacy. Updating-your-browser.org is not responsible for the consequences that follow your interaction with it. If you pay attention to the disclaimer given at Updating-your-browser.org, you will find that it is also not associated with the official distributor of your browser. After installing a bunch of the programs mentioned above, Updating-your-browser.org opens a page which contains four links to the download pages of Mozilla Firefox, Opera, Google Chrome, and Internet Explorer. For example, on clicking the Internet Explorer icon, you will land on the Microsoft website. If you really want to acquire the latest version for your browser, ignore Updating-your-browser.org and access the official website of the browser directly. You do not need all those adware programs on your browsers, so if you have installed them on your PC, take action to remove them. It is also advisable to implement a powerful anti-spyware tool. A reliable spyware prevention tool will examine the system to make sure that it does not contain any harmful files. If any are detected, you will be informed about it immediately. Click Uninstall a program and remove the undesirable programs. Do not forget to scan the computer with the scanner available below once you finish the removal of the unwanted applications. Quick & tested solution for Updating-your-browser.org removal.